Lovingly strewn about the decade-old rental carpet, now christened with baby spit-up and spilled bubble bath soap despite our best efforts to clean it and vacuum on a weekly basis, are toys, the occasional dirty sock, mommy’s water bottle, lengths of ribbon from heaven-knows-where, and books. For babies, books are not just about their content (or their ‘aboutness’ as my Information Retrieval class professor might say—fyi, I’m in grad school for Librarian-ness) but about their physicality and their ability to fit in one’s mouth in a satisfactory manner. In other words, babies chew on books. 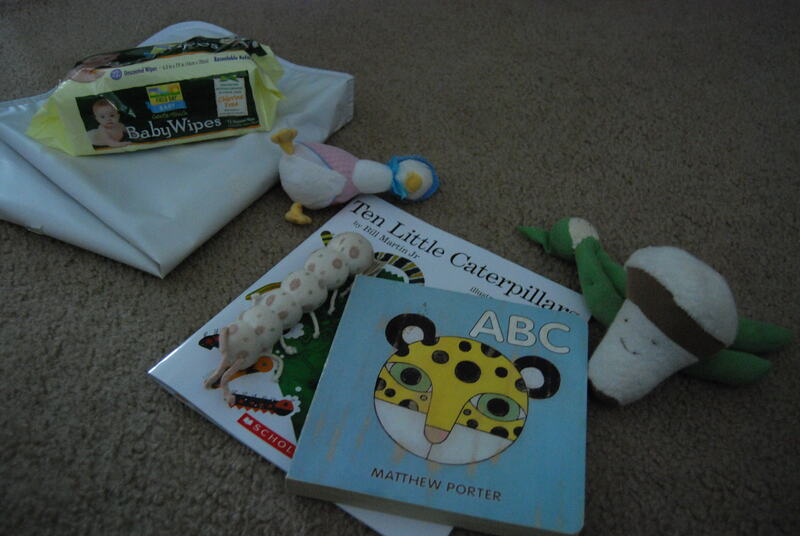 So, therefore we have lots of bright colored books and board books, which get left on the floor once the desired amount of mastication has been achieved. We have no changing table, because I think changing tables are bulky, dangerous and essentially useless. Basically, they’re stupid. Other than that, I have no opinion about them. I can’t change a baby from the side very effectively—I need to stand at her feet to change her. We change our babies on a plastic mat on the bed. The folded mat and the package of wipes kick about on my desk, the bed and, here, the floor. To keep a child still while changing their diaper (or nappy, as we say in our household) we need chewable toys—see aforementioned bit about board books. So we provide organic cotton-stuffed vegetable toys that were a generous gift from a generous Auntie and Uncle. Jemima Puddleduck was also a gift, though I don’t know which store she waddled from. And that is how we live—clean but happily cluttered, with toys, art projects, laundry and babies strewn about the floor. Ten Little Caterpillars written by Bill Martin, Jr., author of such classics as Brown Bear, Brown Bear, What Do You See? and illustrated by Lois Ehlert, who has written and illustrated half of the toddler favorites in our house, such as this one. The adorable Veggie set, including string beans, mushroom and a carrot and tomato (not pictured here) come in a cute little wooden crate from Under the Nile, which also carries organic cotton baby clothes at extremely reasonable prices. I cannot find the veggies on their site at the moment, but here’s a link to their other extremely cool toys. Aww, thanks, Celia! I try to let the mess go most of the time, thinking that if it gets dangerous to the point of being germ-y or a stumbling hazard, it’s time to clean up. Mostly, the mess amuses me… except for those dirty socks.